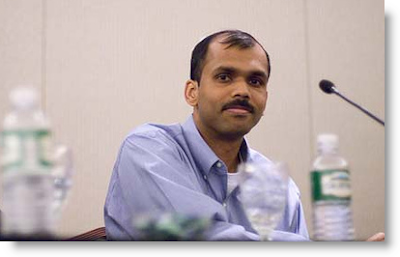 Gokul Rajaram, the god father of Google AdSense and a high-rank Product Manager has left Google to start his own company. Rajaram is the master brain behind the Google's most profitable business, Google AdSense, which accounts more than 1/3 of its Google revenues. I’ve been having the itch to do something entrepreneurial for awhile now. I’m in my early 30s and I have some experience and financial security, so the time felt right. I have some ideas on the consumer Internet side. I’m still trying to flesh that out in the next few weeks. Right now, I’m just trying to get used to not going to work. Rajaram joined Google in January 2003 when the company was working on draft plans of online advertising to sell space on publishers websites to show relevant ads. Rajaram along with other four engineers started the AdSense project and demonstrated the first version of product to top heads of Google in less than six months time. Before quitting Google, he was the key person behind most of the advanced and highly performing AdSense and other online advertising products of Google. Rajaram earned his B.Tech from the Indian Institute of Technology(IIT), Kanpur, and he was also awarded the President of India's Gold Medal for being class valedictorian. Also he earned M.B.A from MIT Sloan School of Management and his M.S. in Computer Science from Texas at Austin. Gokul Rajaram excelled as a bright student and also a great Project Manager at Google. Many people at Google are very much interested to observer his future steps and the revolutions which he is going bring as an Entrepreneur. Thanks to WebGuild & CNN Visit Rajaram's Official Website .